This is a necklace I made for myself for a TV talk show I just had today. Planning the outfit for the show, which by the way was a plain chiffon blouse in the softest peach you can imagine over plain black trousers, I wanted to make a vivid, playful necklace that would give life and texture to the blouse. Immediately a beaded butterfly came to mind surrounded by flowers - just as you see it, so I made a couple of my favourite flowers - just as I did for this one not long ago. The beads as you see them, were not part of the original design. As a matter of fact I wanted the beaded chain to hang under the flowers, but it was not good- not good at all - take my word for it - and I tried putting those short beaded chains at the side and quite liked how the whole piece came together when I did. And that is how my newest necklace was born. As for the TV show, it was fantastic! (Follow my insta stories!!!) I was invited over for a chat due to my feature in the Artful Blogging Magazine. I had the greatest time and talked my heart out. I talked about the feature, my blog and how everything started in the first place. The lighting in the studio was not intended to make great smartphone photos so here's a grainy one with my hosts Tino & Spasiya. Maya, your necklace is beautiful! I'm always in awe of the colours that you use. 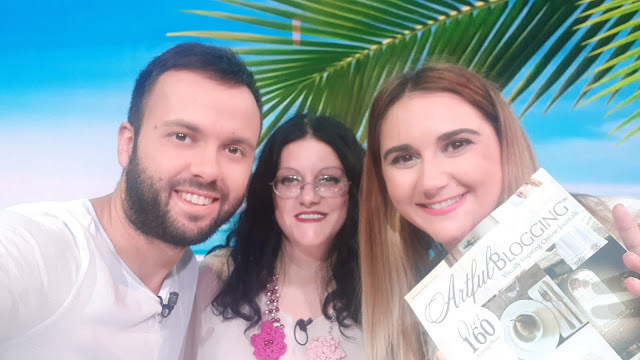 Congratulations for being a guest on the tv show - a compliment to your talent. Wow! Congrats on being a guest on a TV show. I hope you had a experience. What a great experience, Maya!!!!!! Definitely unique!!!!!!! Congratulations for the TV show, my friend. Your necklace is stunning!!!!!!!!!!! Kisses!!!!!!! How thrilling - pitty we won't be able to see that TV show here... But your necklace was stunning - as all your jewelery is! Thank you Alhana! I appreciate it! A most beautiful necklace; just perfect a TV star. =) How positively exciting for you, Maya. A beautiful necklace for a beautiful lady. Congrats Maya, you are a super star and extremely talented. A superb choice of colors for your personal necklace. I'm sure it looked wonderful on your peach-colored chiffon blouse. And I've always thought that your crochet flowers are simply divine. Have a wonderful week, dear! Congratulations Maya, your necklace was perfect for the TV show, but you are such a talent you only need to do your thing and they will come to you! I am on Folt Bolt! Our First Crochet Tube Necklace Kits!